Money Word Problems in rands,totals,change,coins and notes. A grade 3 money word problem worksheet in South African Rands. 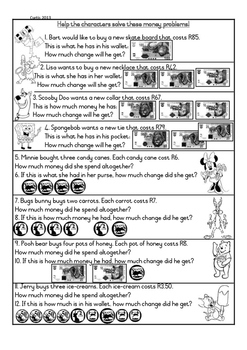 The cartoon characters buy things and the children have to work out their totals. Children then have to look at the notes and coins that they are paying with, and then work out the change.